Engaging Theories in Family Communication, Second Edition delves deeply into the key theories in family communication, focusing on theories originating both within the communication discipline and in allied disciplines. Contributors write in their specific areas of expertise, resulting in an exceptional resource for scholars and students alike, who seek to understand theories spanning myriad topics, perspectives, and approaches. Designed for advanced undergraduate and graduate students studying family communication, this text is also relevant for scholars and students of personal relationships, interpersonal communication, and family studies. 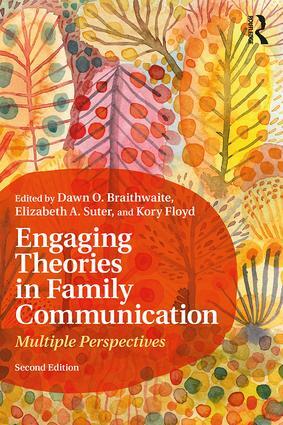 This second edition includes 16 new theories and an updated study of the state of family communication. Each chapter follows a common pattern for easy comparison between theories. Chapter 5: Attribution Theory: Who’s at Fault in Families? Dawn O. Braithwaite is a Willa Cather Professor and Chair of Communication Studies at the University of Nebraska-Lincoln. She studies communication in discourse dependent (postmodern) families, dialectics of relating, and rituals in step- and voluntary families. She has published five books and 125 manuscripts. Braithwaite received the National Communication Association’s Brommel Award for Family Communication, was named Distinguished Scholar of Western States Communication Association, and is a Past President of the National Communication Association. Elizabeth A. Suter is an Associate Professor of Communication Studies at the University of Denver specializing in critical interpersonal and family communication. Her research lies at the intersection of relationships and culture, addressing issues of power, struggle, and social change. She co-edited the special issue of the Journal of Family Communication on critical approaches to family communication research, and is an officer of the Family Communication Division of the National Communication Association. Kory Floyd is a Professor of Communication at the University of Arizona. His research focuses on the communication of affection in close relationships and on the intersection between interpersonal behavior and health. He has authored or edited 15 books and nearly 100 journal articles and chapters on interpersonal and family communication, nonverbal behavior, and psychophysiology. He is a past editor of the Journal of Family Communication and Communication Monographs.